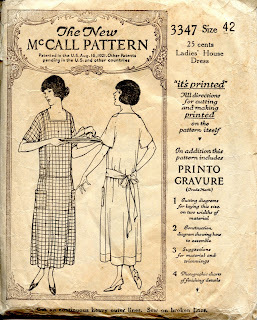 This is a nice house dress pattern from the early 20's. The waist line has dropped but the lines aren't as severe as they'll become in another year or so. The artist seems to be a bit vague on how to draw a chicken - at least, I think that's what is supposed to be on the platter. If so, that invests the illustration with some additional meaning. "A chicken in every pot" would become part of a campaign slogan for Herbert Hoover in 1928. So in this case we can read the chicken as a mark of prosperity. A prosperous housewife dresses nicely in a housedress she's made from a McCall pattern, and she is able to serve her family a chicken. Here are some details along with photographs of this housedress made up. You may want to view it full screen so that you can read the captions. Yes, this is an Amy Butler fabric from about four years ago. It wasn't intentionally "vintage" but as soon as I saw it I thought of this pattern. Love this posting and the bit of history relating to Hoover and the chicken! Thanks so much. Love the apron. Thank you! There are more good things to come! That's such an intriguing construction - I love sewing patterns like this with unconventional bodice pieces - this would come together quickly without the bias trimming.